Whether it's the world's largest beaver dam - so remote it was only discovered through satellite imagery - or newly formed islands born from volcanic eruptions, discover a new perspective on our ever-changing planet. You don't know home until you leave it. With over 200 spectacular images, including astonishing satellite images and stills from the BBC Natural History Unit's footage, Earth from Space reveals our planet as you've never seen it before. For decades we competed to be the first to reach space, but it was when we looked back at Earth that we were truly awestruck. Now, for the first time, using advanced satellite images we can show the earth's surface, its mega structures, weather patterns and natural wonders in breathtaking detail. 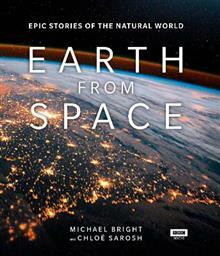 From the colours and patterns that make up our planet to the mass migrations and seismic changes that shape it, Earth from Space sheds new light on the planet we call home. 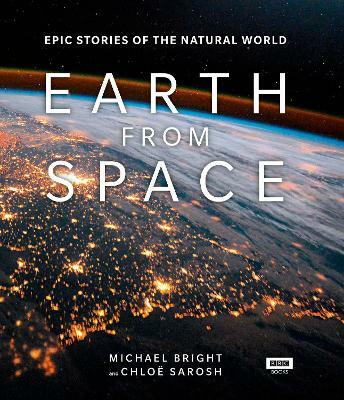 It reveals the intimate stories behind the breathtaking images, following herds of elephants crossing the plains of Africa and turtles travelling on ocean currents that are invisible at unless seen from space. The true colours of our blue planet are revealed, from the striped tulip fields of Holland to the green swirl of a plankton super bloom that attracts a marine feeding frenzy. Whether it's the world's largest beaver dam - so remote it was only discovered through satellite imagery - or newly formed islands born from volcanic eruptions, discover a new perspective on our ever-changing planet. Michael Bright (Author) Michael Bright is the author of over 125 books including 100 Years of Wildlife, Wild Caribbean and Africa- Eye to Eye with the Unknown. As a senior producer with the BBC's Natural History Unit in Bristol, he produced Perfect Shark with Mike deGruy, Natural World- Ant Attack, and British Isles- A Natural History with Alan Titchmarsh. Chloe Sarosh (Author) Chloe Sarosh is a natural history writer and the series producer of Earth from Space. She has worked on a wide range of wildlife and science television series, including Chris Packham's Nature's Weirdest Events and World's Weirdest Events, and Planet Earth Live for the BBC's Natural History Unit.